Both Cure RAH shows for TCT are SOLD OUT! However, agents may return odd tickets as they sweep for touts/multiple bookings; so periodically over the next week or so tickets will likely appear on either gigsandtours.com or Ticketmaster.com. Also, nearer the dates of the shows some 'debenture holders' will probably donate their seats to the charity, meaning a few more tickets will appear for sale in March, right up until the day of the show. I’m letting you know this not because we need to publicise, but just in case you wonder why every now and then someone is able to buy a ticket and posts about it on Facebook! Please keep checking back with gigsandtours, and thank you again for your wonderful support of Teenage Cancer Trust. The Cure play London on March 28th & 29th! 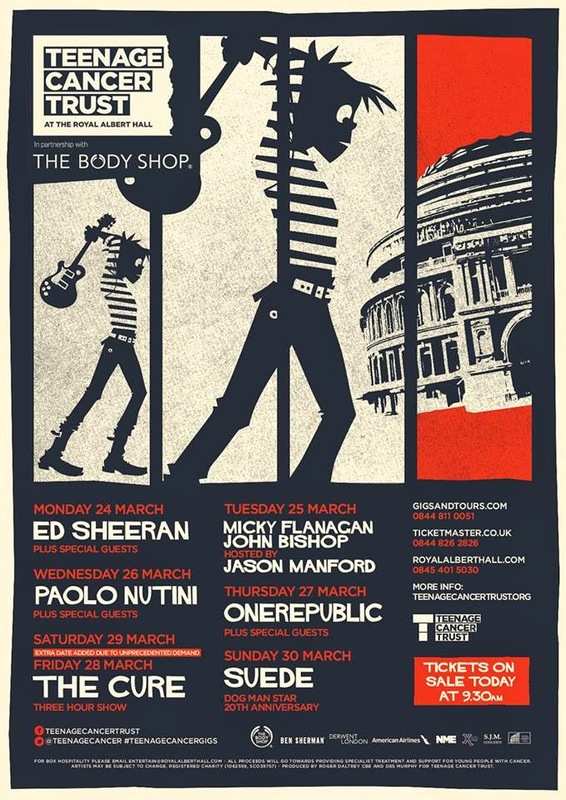 The Cure will play the Royal Albert Hall on March 28th & 29th, 2014 as part of the Teenage Cancer Trust series. Tickets on sale Friday (Jan. 31st) at 9:30 am. There's a 4 ticket limit per person. "One of the UK’s most influential bands, The Cure will play an exclusive 3 hour show on Saturday 29 March. " Update: Fan pre-sale today (Jan. 30th) at 9 am here. Good luck! Looks like we are 'beating the touts", as numerous fans are reporting that they were able to get tickets. Excellent! Congratulations! Update: 2nd show added on the 28th. Tickets on sale now. Looks like nothing went on sale for the March 29th show. They really did release everything in the pre-sale. Hope you didn't wait for today. Both shows are now sold out. From JC/Perfect.Murder: "First in line at the RAH Queue"
Yes I'm in LA working primarily on finishing the music for our ballet production and on a couple of very interesting film projects! "For those who still haven't seen it: The Cure's set at Hurricane Festival 2012 will be shown on Polish TVP Kultura (available via satellite: Astra 19,2e / 10862 h / 22.000 / fec 7/8) on Monday 27th January, 2014 from 11.40pm - 0.50am (GMT+1)." A Cure fan at the NY Times?